In this video we will learn about, INSTEAD OF DELETE trigger. An INSTEAD OF DELETE trigger gets fired instead of the DELETE event, on a table or a view. For example, let's say we have, an INSTEAD OF DELETE trigger on a view or a table, and then when you try to update a row from that view or table, instead of the actual DELETE event, the trigger gets fired automatically. INSTEAD OF DELETE TRIGGERS, are used, to delete records from a view, that is based on multiple tables. 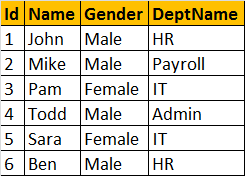 Let's create the required Employee and Department tables, that we will be using for this demo. Since, we now have the required tables, let's create a view based on these tables. The view should return Employee Id, Name, Gender and DepartmentName columns. So, the view is obviously based on multiple tables. In Part 45, we tried to insert a row into the view, and we got an error stating - 'View or function vWEmployeeDetails is not updatable because the modification affects multiple base tables'. Along, the same lines, in Part 46, when we tried to update a view that is based on multiple tables, we got the same error. To get the error, the UPDATE should affect both the base tables. If the update affects only one base table, we don't get the error, but the UPDATE does not work correctly, if the DeptName column is updated. Now, let's try to delete a row from the view, and we get the same error. Notice that, the trigger tr_vWEmployeeDetails_InsteadOfDelete, makes use of DELETED table. DELETED table contains all the rows, that we tried to DELETE from the view. So, we are joining the DELETED table with tblEmployee, to delete the rows. You can also use sub-queries to do the same. In most cases JOINs are faster than SUB-QUERIEs. However, in cases, where you only need a subset of records from a table that you are joining with, sub-queries can be faster. Instead of Insert DELETED table is always empty and the INSERTED table contains the newly inserted data. The syntax is a little different from the standard delete statement ... could you explain the logic for the delete tbl from tbl please? The subquery version I understand. Hi,venkat..join will give better performance comparing to subquries..please can you explain with an example.